Verb & noun. Late 16th century. Boggle, by Parker Brothers, is a great game. It's a bit like Scrabble, but without the crippling tedium. There's no waiting for others, but rather you all have three minutes to find as many words as possible within the 4x4 grid. You may only use each letter once, and letters from a word must be connected in the correct order. As the time counts down, each player writes his words on a piece of paper, and these are scored at the end of the game. If you have the same word as another player, no point is awarded for that word, and more points are awarded for longer words. That's it. It's all childishly simple. In my day (if I may toot my boggle bugle), I was rather good at Boggle. Like Scrabble, a good knowledge of short, unusual words is a telling advantage, and my strategy would generally involving blitzing through as many three and four letter words as I could, rather than going for the nine letter slam-dunk. Therefore, words like ben, tor and auk, as well remembering that individual letters have spellings too (ess, for example) will reap you a bounty of words with minimum risk that another player will write the same. And if conversation is running a bit dry during a game of Boggle, you can always talk about what an interesting word boggle is. Not only does it mean to baffle, but it's also the verb for startling like a shying horse. In fact, if you really want to be the centre of attention, you can tell people that the related noun boggard is an 'object at which a horse boggles'. Armed with trivia like that, getting a date (or conversing during one) will never be a problem again. 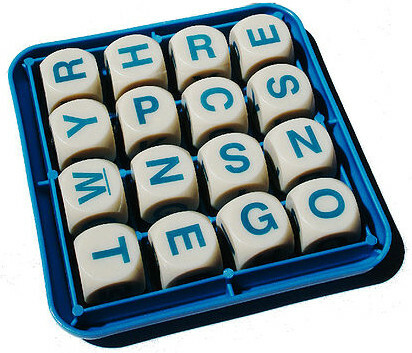 Adhering to the rules of Boggle, what's the longest word you can find in the grid above? Do you please share this post and leave your most beboggling comments below. I didn't come up with any delightful long words. However, if you change that O in the RH corner to I, pressing would be a good word! There are always moments like that - "Ooh! If only there was an S, U, R, M, I, S, I and an N, I could make 'surmising' with that G in the corner." Well done for 'press', Jingles! I thank C for the well done, but it pales beside his word(s). Wench. No, cresson. No, snogs, definitely snogs. 'Cresson' is a word, C. It's a shade of green, so well done you! I know cresson is a word ed. That's why I suggested cresson. Because it's a word and boggle is a word game. Why didn't jingles get a 'well done you' for press? Press is also a word ed. However I want snogs, not a shade of green. Oh for ... you got a well done because you suggested the longest word which was the aim of the game. Never mind. I shall give Jingles her very own 'well done' too. There. Could someone please educate the foreigner on the meaning of "snogs"? Since C is so fond of it... It sounds like something rather disgusting, actually. Hehe. Are you sure you want one of this lot educating you on that particular subject? Aw man, it really is something disgusting, right? Certainly, if done improperly. You'd really want to consult an expert. Was your first kiss a snog? My first kiss definitely wasn't a snog. It was definitely something that deserves a gross name like "snog". Incidentally, I have a cold and my wife says she has a headache. I'm not sure what to think now, because phlegm sounds like a horrible disease. Relentless snot still seems kind of manageable, while phlegm sounds like a chainsmoking grandpa trying to clear his lungs. Incidentally, Grandpa says Grandma has had a headache for the last 15 years. I think you guys should consider a different family doctor. As I said, it's best to leave these things in the, um, hands of experts. Hmm, if one is especially picky in their choice of partners, would they be a snog-snob? Nothing wrong about being picky in snogging partners. Bacteria, you know... Snog smart, avoid phlegm and relentless snot. Why oh why couldn't you just have stuck with 'cresson' C? I know. Now everyone's a shade of green. PRESS GENT. Despite staffing cutbacks, I'm sure you can still find a few gents at most of the major newspapers. Maybe I would like this game. I don't have the patience for Scrabble - with some people it seems like it takes an eternity for my turn to come around. Agree completely on Scrabble (which I grew up on), especially when someone takes 15 minutes for their go and then plays c-a-t or something. and don't even get me started on blind 5-year olds from lower castes. She accepted, they're very happy, but he was somewhat miffed that the photo of the board that he took to show his family & friends was met with hilarity rather than 'how romantic. Hahaha! That's brilliant! And c'mon ... they're only human. Who's above a good old-fashioned willy joke? By the way, the man in question is an Irish author, was half expecting you to say 'that was me and that's not what happened at all'!